My name is Jegadeesh and I am from salem. I have studied in Tamil medium up to 10th standard and got diploma in 2008 and engineering in 2011. At present I am working in a PSU Oil company near chittoor. 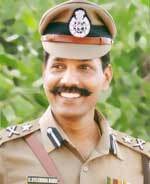 Sir, My aim is to become an IPS officer. Sir, From my college days onwards, I have been seeing your inspirational speeches in youtube. It has inspired me to sail my boat on hard waters. Thank you, Sir. To prepare for this toughest examination, I decided to join Civil Services Coaching in new Delhi on June 2016 by taking six months leave on loss of pay. Sir, Now, everyday I am studying 1 to 2 hrs by self preparation after my duty hours. I have a six working days in a week and one holiday. Sir, Now I have taken a personal loan for joining coaching but I am unable to decide whether to go delhi for coaching by taking leave or to prepare my self for the examination. Kindly please guide me Sir. convey my love and heartfelt condolences to your beloved mother. Your personal tragedy should not stand in anyway on your ambition of IPS. bank, and in those days we had to work in the bank till ate in the evening. and again from morning 5 am to 9 am for the Civil Services Examination. there are many holidays, CL and EL that we can make use of to study. Thank you, sir. Your meticulous study plan has been encouraging for me sir. I will study daily 5 hrs by using my time productively. I will successfully take up the civil services exam in 2017. Now I have started studying NCERT Books for Science, Social studies and History. For Current affairs, daily I am reading The Hindu newspaper and reffering Race Institute website sir. You are in the right track, KEEP MOVING.